Relay is this Friday: March 29, 2019! Did you know... Shorecrest has raised an outstanding total of nearly $1.2million since 2006 benefiting American Cancer Society!? Click to learn where the money goes. 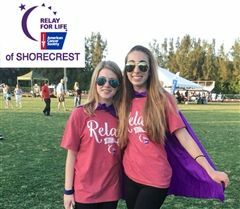 2019 marks the 14th year of Shorecrest hosting a Relay For Life on campus. An entirely student-run event, the 2019 Event Co-Chairs are Olivia Olson '19 and Jordan Tralins '19. Each year at Relay, a special honor is paid to survivors & caregivers. You will be treated to a delicious dinner and seated in the shade of our decorated tent. Come and be a part of this fun and important evening! RSVP for the reception to Jessica Sheets, jessica.sheets@cancer.org or 813-319-5928. Thank you to our 2018 Relay For Life sponsors! 400 Beach Seafood & Tap House, Blankenship Pediatric Dentistry, Insoft and Hurst Orthodontics, Levitt & Prasatthong DDS PA, and the Shorecrest Faculty. You can make a meaningful contribution to the American Cancer Society as a Relay For Life sponsor. If you or your employer would like to sponsor an event, please contact: Ashley Ballestra at asballestra@shorecrest.org. 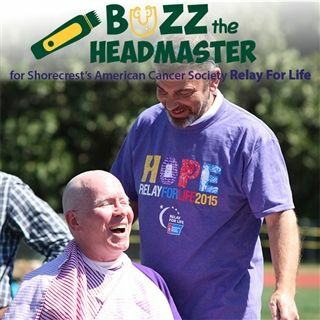 Three weeks and $22,000 dollars later, Shorecrest hosted a televised head shaving event. Billy Hume from Billy’s Corner Barber Shop on 4th Street agreed to buzz Mr. Murphy's head and to help raise money for Relay. Jess Farkas donated her time to buzz Jordan's head in front of the cameras in March of 2015. "I am inspired by the leadership, concern for others and initiative demonstrated by our Shorecrest students as they commit to this service endeavor." Headmaster Mike Murphy commended.